I discovered Erzulie while searching for organic skincare options on etsy and have been using their products for several months now. 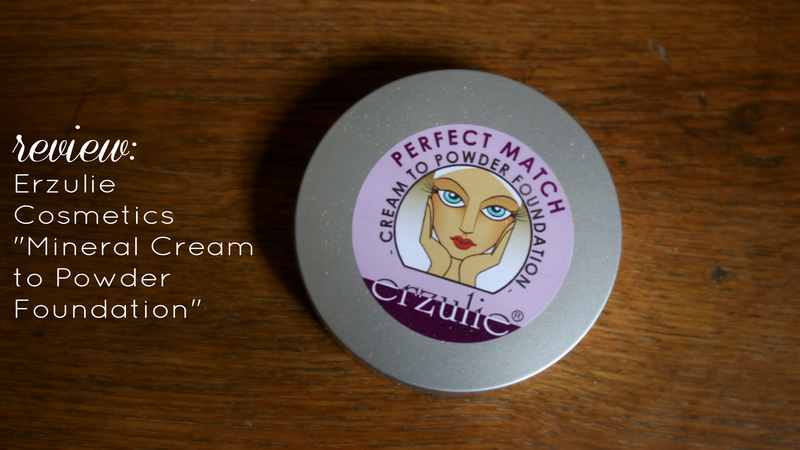 Recently, I purchased the Mineral Cream to Powder Foundation in Light on the seller’s recommendation. I have used it every day for the past few weeks, so I think it’s time to review it. You should know before I start that I have sensitive, combination, acne-prone skin that gets very dry in patches during the winter months. I turned to organic skin care initially in order to avoid artificial fragrances, but there are so many other benefits (and there are so many great products) that I’ve stuck with it for additional reasons. I used Erzulie Liquid foundation before trying this kind. I like the coverage this provides better, but the liquid is a bit easier to use. I use a nice quality thick sponge applicator for this instead of the provided pad. I knocked off a point due to the poor quality provided applicator and the firmness of the product. If it were a bit wetter, I think it would be easier to apply. In conclusion, I will continue to use Erzulie Cream to Powder Foundation and will likely buy it again once I run out of my current supply.